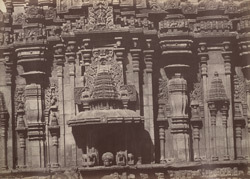 Photograph of the sculptured wall of the Lakshmi Narasimha Temple at Harnahalli in Karnataka, taken by William Henry Pigou, c. 1856, part of 'Architecture in Dharwar and Mysore'. The Hoysalas were a dynasty which ruled in the southern Deccan from the early 12th to the mid-14th century. Renowned temple builders, the Hoysalas have left a rich legacy of temples, particularly at the sites of Belur and Halebid, which were formerly their capitals. The name of the dynasty refers to the legend about its founder, a local chieftain named Sala. When faced with a tiger, he did not back down but spurred by the cry 'hoy, Sala!' or 'strike, Sala! ', he killed it single-handed. The Vaishnava Lakshmi Narasimha Temple at Harnahalli dates from 1234 and is an example of the mature Hoysala style. Characteristics of the style are multi-shrined complexes on star-shaped plans, built on tiered platforms which echo the shapes of the structures they support, bands of sculptural friezes with the stone carved as delicately as sandalwood and ivory, lathe-turned columns and perforated stone screens.